Write “Brian Bosworth” on the outside of an egg, crack it open on the pool table in the middle of David Painter’s basement, and it will cook in five seconds. 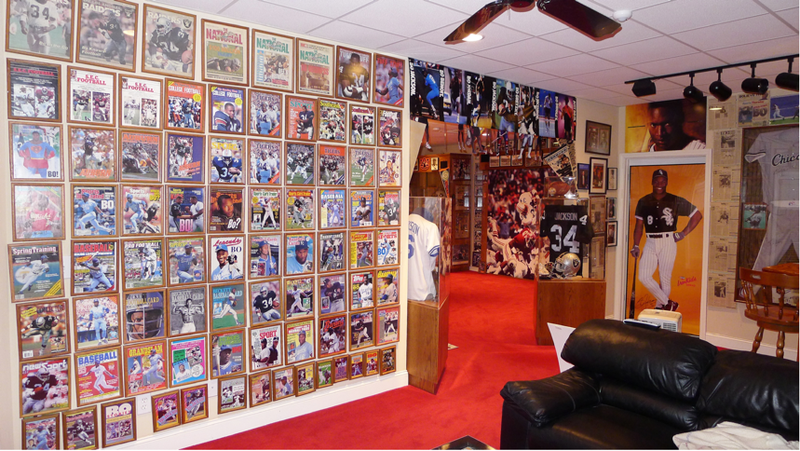 David Painter went over the top. 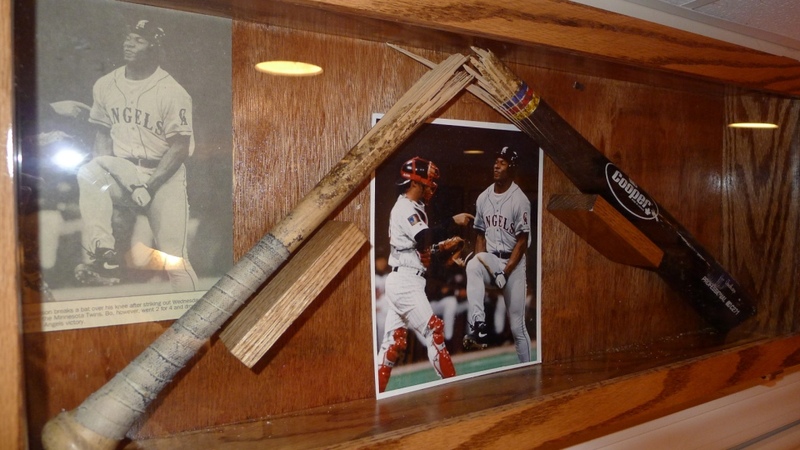 “Happened to collect” kind of seems like an inadequate description of what Painter, a life-long Auburn fan, has done with Bo Jackson, in the same way that “happened to play” would be an insult to what Bo Jackson did at the plate, or on the outfield wall, or between the hash marks. 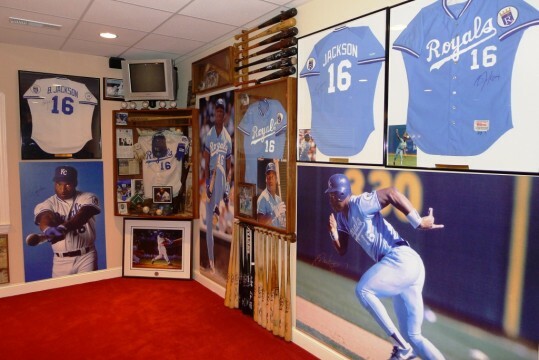 David Painter’s Bo Jackson collection is the Bo Jackson of Bo Jackson collections. 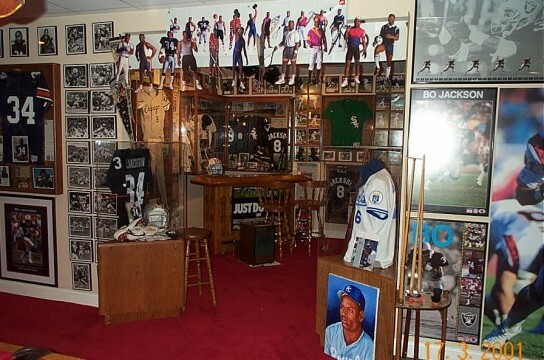 Over the course of nearly 30 years, Painter has turned the 1,200-square-foot basement of his Greenville, South Carolina home into a veritable Bo museum, piece by fantastic piece. The collection has been featured in various newspapers. It’s been featured in Sports Collectors’ Digest. 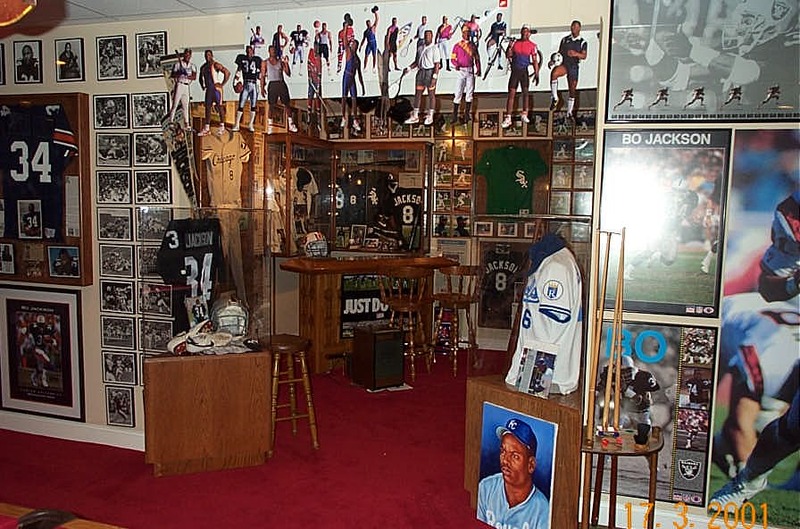 When Auburn’s athletic museum needed pieces for a display to commemorate Bo’s induction into the College Football Hall of Fame in 1998, they called Painter. He doesn’t know how many items he has. Hundreds? Thousands? (He also doesn’t know how much he’s spent on them, and he doesn’t really want to know.) It’s enough to tile his walls floor to ceiling with framed posters, game programs, Beckett’s guides, media guides, and Sports Illustrateds with Bo on the cover, and rare photos from almost every phase of Bo’s athletic career. 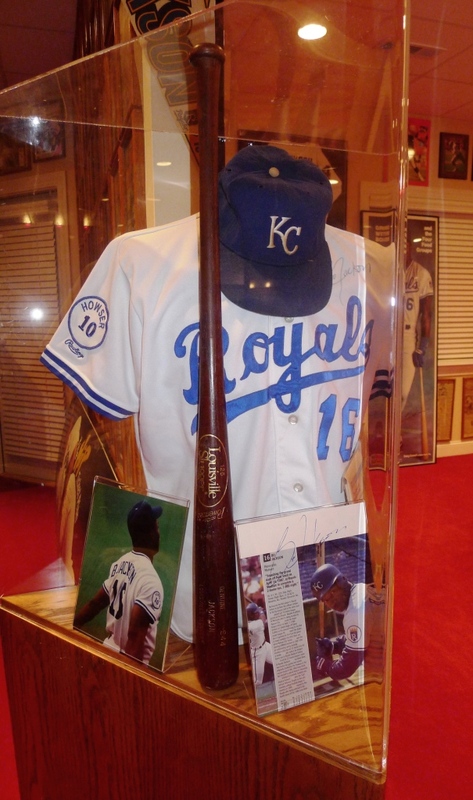 Glass cases hold Bo’s football helmet from his junior year at Auburn and one of the bats he struck out with and broke over his thigh while batting for the Royals; those are worth the most, at least to Painter. 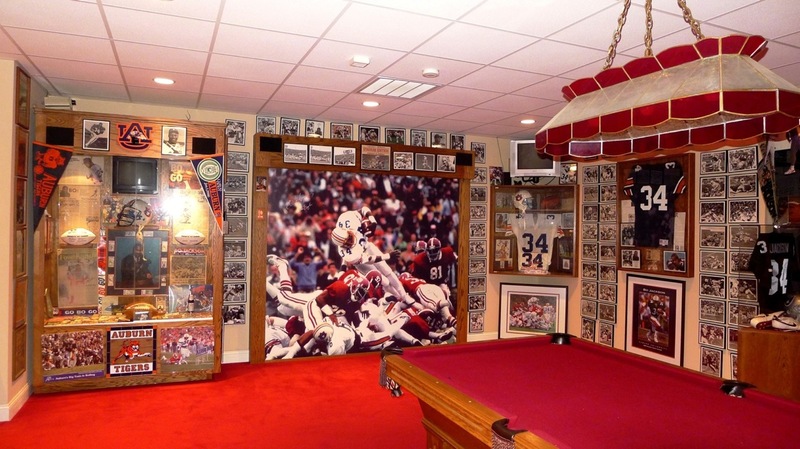 But the wildest thing in there, at least visually, is the life-sized print of the photo of Bo going Over The Top, the iconic play that broke Bear Bryant’s stranglehold on the Auburn-Alabama rivalry. And somehow, even that thing is autographed. 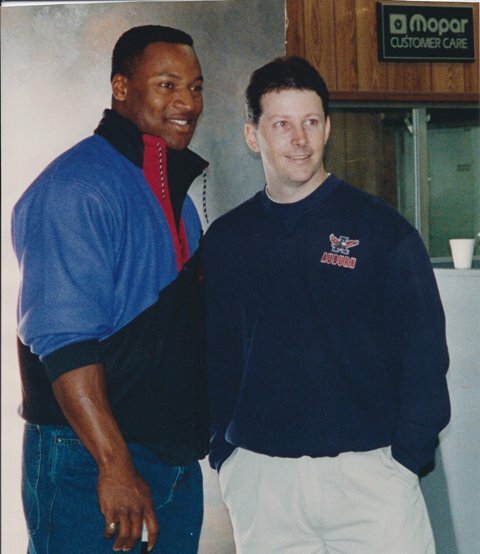 No, that’s not Painter with a life-size wax statue of Bo, that’s actually him, posing with Painter while promoting the opening of James Snell Motors in Opelika in the early 90s. Many pieces from Painter’s collection were on display at the event. But long and expensive kind of defined Painter’s level of collecting in the days before eBay. Most of Painter’s pieces were acquired via fan expo road trips and classified ads and back booth rendezvous at the Opelika Road Chili’s in the 1980s and 1990s, before the internet made it all so easy, so dull. 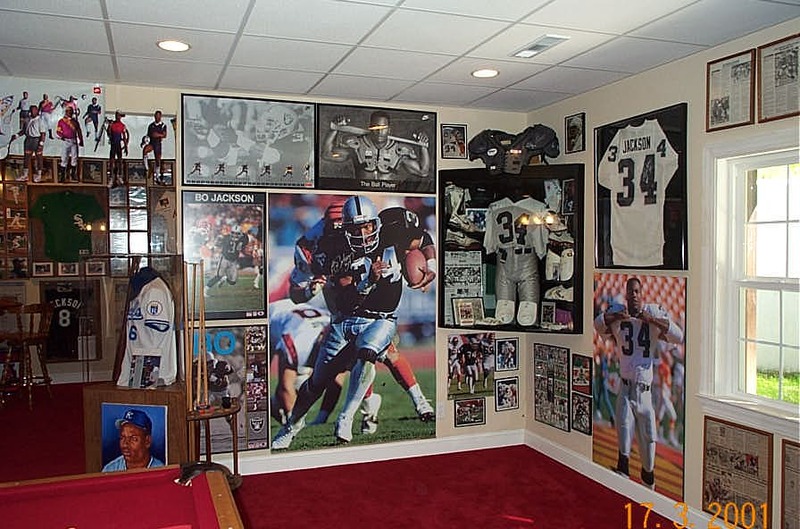 Only an analog era level of commitment could justify flying an intermediary to Los Angeles to broker a deal with the Raiders’ former head trainer for Bo’s practice jersey, game-used pants, pads…even used (and of course autographed) ankle tape. That’s actually how I found out about David. 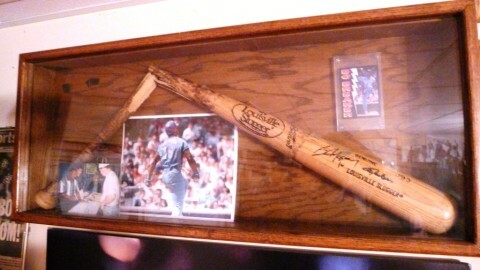 He put the ankle tape up for auction on eBay. I saw it. He’s slowly trying to unload some of the later stuff. He sent me some pictures. Does Mr Painter take visitors? I drive through Greenville a lot and would love to see this. 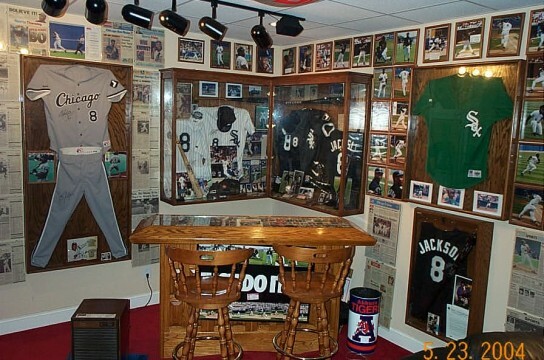 As impressive as it is creepy. He had me at the seamless transition between his eagle-A sweatshirt and Bo’s windbreaker. 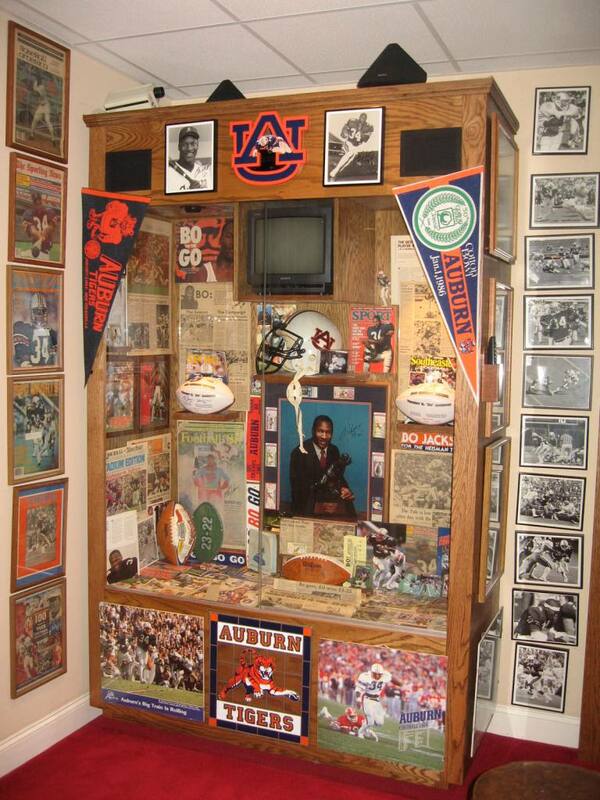 Showing this to the husband…he can no longer say my Auburn memorabilia collection is ‘too much’. Nope…he cannot! Very Nice! My only suggestion is to get rid of the red carpet and put down navy blue or burnt orange. 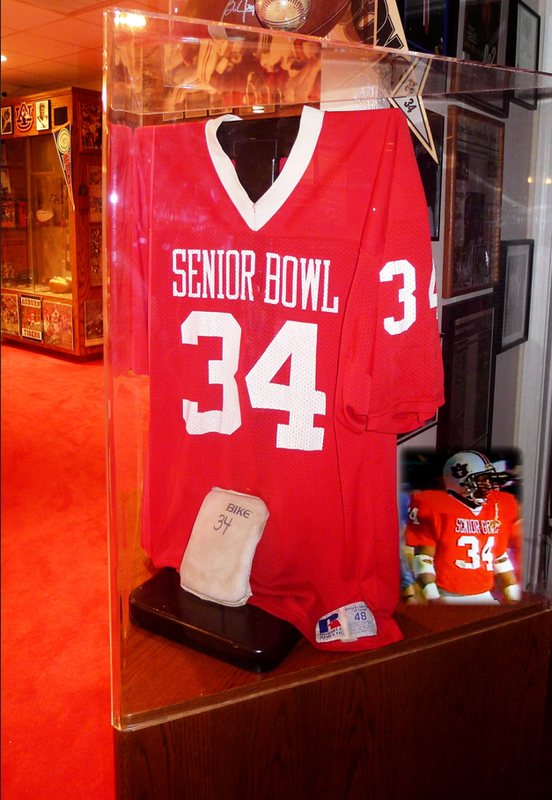 Looks kind of strange, Bo didn’t play for Alabama. I was thinking the same thing as Jeff. Get rid of all that red! When you enlarge the top picture, the carpet looks more burnt orange than red.